We just started 2019 but tax season is right around the corner. With new tax laws, there is an uncertainty in the air when it comes to refunds and owed taxes. Furthermore, with the government shutdown still going strong, we still don't know when tax season will officially begin. With that being said, you can still start preparing now. If you are going to need to itemize deductions, you definitely need to get all your receipts and documents together asap. If you don't already, keep a separate box for these papers. Next year's taxes will be that much easier to tackle if you do. Side note: you don't need to send any of it in but you do need them if you happen to get audited. In order to file this years taxes, you will typically need last years. Take a moment to review your filed return and if you ended up having any issues, see how this year can possibly go smoother. You may even decide it would make more sense to hire a tax professional this year. Take a look at last year's filing status and see if you have experienced any life changes during the past year that may affect your filing status for 2018 (i.e. getting married). If so, see what you need to do differently. Take a look at your W-4 form and see what your tax withholding was from last year. This affects the amount of your refund. If you have a smaller deduction taken out from each check, the smaller tax refund you will get. The larger the deduction, the more you will get back in your refund. Depending on your own financial situation, one may work better than the other. Take note in how your withholding worked for you this past year and make any necessary changes for the upcoming year. In addition, the IRS has a tool to help you determine whether your withholding is good for you. If it's not, get with payroll at work and make an adjustment by filing a new Form W-4 with your employer. If you are a resident or non-resident alien, you need to make sure your ITIN (individual taxpayer identification number) will not be expiring in the next few months. You don't want to wait till the last minute to submit a renewal application. Most taxpayers will be dealing with new tax forms this season. Head over to the IRS website to see all the new forms so you are familiar with them. It is great to get that windfall of money in a tax refund but not everyone will be so lucky. Depending on what your withholding was this past year, you may actually owe. Look into what yours are and see if you may owe taxes for 2018. If it looks like you will, start budgeting now so you won't be overwhelmed coming up with the money when it's due. Contribution limits for your 401k went up in 2018 so you can now put in up to $18500 as opposed to $18000. If you can swing it, max out that contribution over the next few months. Social security benefits are on their way out some say so your retirement accounts are that much more important. If you donate to any charities throughout the year, those are tax deductible. Always get documentation of any donations so you have them handy. If you have not donated and you can financially, find a charity. You will be helping someone in need and you get the tax benefit. If it looks like you will be one of the lucky ones to get a tax refund, sit down and give some thought as to where that money will best serve you and your current life situation. Do you have debt that needs to be paid off? Do you have that important emergency fund set up yet? Take stock in your finances and your budget and see where it makes sense to put the money. If you are debt free perhaps saving some and putting some towards a much needed vacation makes sense for you. Tax season is not the only time to check in on one of the most important numbers associated with your name, your credit score. Your score affects your finances and potentially your taxes. Every year you are entitled to your credit report from the 3 major credit agencies (Experian, Equifax and TransUnion). AnnualCreditReport is the most reputable site you can use. 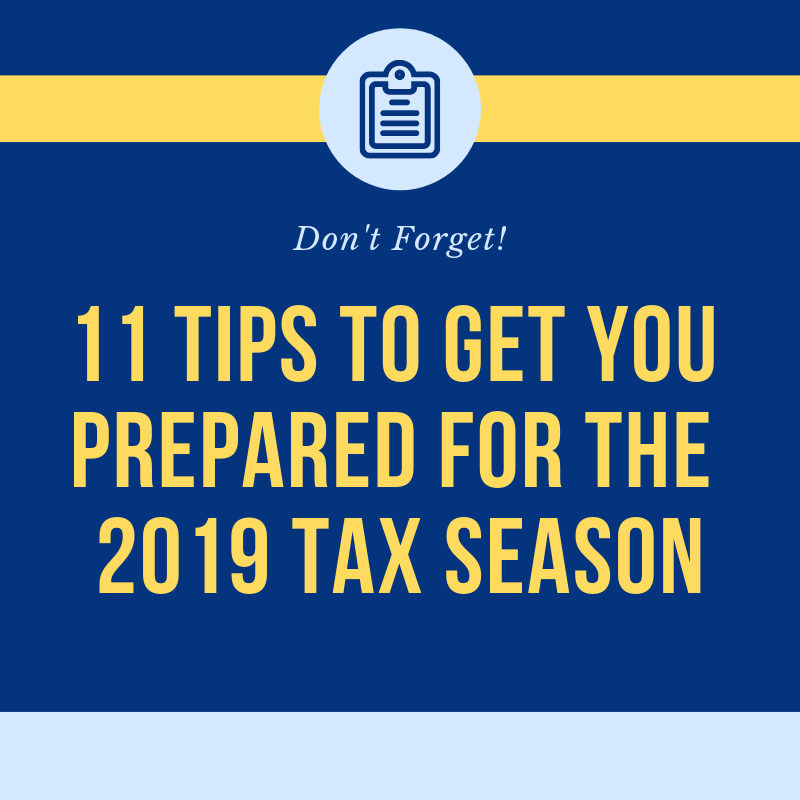 With tax season around the corner, now is the time to start preparing so you are not overwhelmed trying the meet the deadline. Although there are uncertainties as to when the official tax season will start, preparation is key. The above tips will help you plan accordingly and here's to a nice return with your name on it.